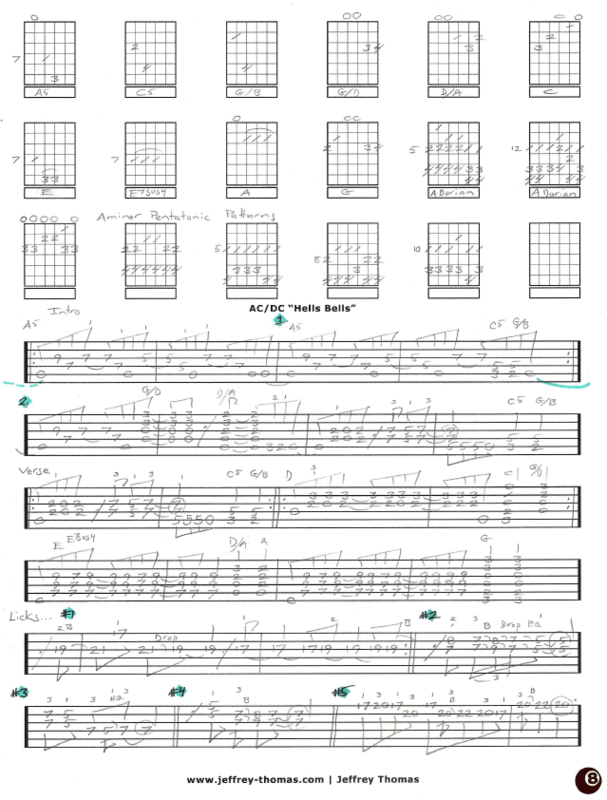 AC/DC Hells Bells Free Guitar Tab by Jeffrey Thomas. In this tab you will learn the intro lick, verse and basic song structure. I did not write out the solo but included five signature licks from the solo, all five pentatonic patterns for A minor and two A dorian scales to get you playing the right stuff for solos. Here is another highly requested AC/DC tune by my rock guitar students. Want the guitar tab for free? Just send in your email address using the form provided. Looking for the best online guitar lessons? Fill out the Schedule A Free Lesson form to set up your free Skype guitar lesson today. Did you know “Hells Bells” was the first AC/DC album without Bon Scott? I hope you enjoy the free guitar tab and make sure to check out my online guitar tab archive for more lessons, tabs, tips and tricks.